Generally, I am someone who likes to get things done fast, because I hate to not put off to tomorrow what can be accomplished now. Yet sometimes, I can be quite a big procrastinator and suspend chores until a later time (next days, weeks or months) instead of taking care of business straight away. Some months ago (at least 5 months ago), the Editions Larousse gracefully sent me a few of their new releases to review. Being a serious blogger, I carried out my assignement without delay and wrote lengthy posts about most of them. However, one single book was left aside. For some unknown reason and no matter how much I adore the subject it deals with, I never seemed to find the right moment to choose a recipe from it, put an article together, cook the dish and photograph it. At first it feels good, but in the end you're only screwing yourself. " So, this Friday I have chosen to babble about "Tagines & Couscous" which is Ghillie Basan's smallish (144 pages long), but nonetheless extremely interesting publication which is a fabulous compound of scrumptious Moroccan tagine, coucous and side dish recipes (60 all in all). Apart from being a restaurant critic and workshop host, this Scottish-based chef is also a cookery and travel journalist/writer whose articles appeared in magazines as well as newspapers (the Sunday Herald, Scotland on Sunday, BBC Good Food Magazine, TasteTurkey as well as Today’s Diet and Nutrition) and who has written a number of highly acclaimed books (over 20) about the traditional Middle-Eastern and Southeast Asian cuisines. Ghillie Basan's book dispenses a wide variety of classic formulas for rich, hearty and aromatic meat (chicken, lamb, beef and duck), fish, seafood and vegetarian tagines (one-pots flavored with fragrant spices, cooked and served in heavy clay vessels called tagines which are generally painted and glazed - tagines are a dish as well as a piece of kitchenware), couscouses, sides (salads, ratatouilles and grilled vegetables), condiments (ras-el-hanout, harissa or preserved lemons) and desserts (melon or orange salads). Her mouthwatering concoctions are delicious, colorful, spicy and authentic. Thanks to her easy to follow recipes, you'll be able to recreate an Oriental-style feast without trouble and in a matter of minutes as a majority of the casseroles demand less than 40 minutes of preparation. And you don't even need a the real vessel to cook them to perfection. As a mattrer of fact, you'll obtain the same results with a cast-iron pan. The "Spicy Carrot & Chickpea Tagine" I am presenting today is just marvelously rustic, hearty and pungent. It is a quick, vegetarian, nourishing, versatile and refined cold weather meal that is common to areas of Morocco where meat is considered a luxury. It pairs really well with yoghurt and flatbread (check out my "Batbout M'Khamer" recipe). An excellent mezze item or main course! The Fairy Hobmother visited me and granted one of my wishes! Many of you might have already heard about The Fairy Hobmother... For those who think that I've lost my marbles, watched too many fantasy films à la "Lords Of The Rings" and read quantities of epic novels, be reassured, everything is ok with me. I have not yet lost all my mental capacities and I am far from having taken any psychedelic drugs. No! I am just talking about someone who works with Appliances Online, an internet store which sells all sorts of home appliances ranging from cookers to washing machines. In his/her free time, he/she visits blogs and distributes out gifts (hand mixers, Amazon gift vouchers, washing machines, etc...) to individuals. As you might have guessed by now, I am one of those happy few who got a visit from one of those good doers and was kindly offered a 50£ Amazon voucher! You can imagine how huge the grin on my face was when I received an e-mail annoucing me the news. I never would have thought that this could happen to me after visiting Angie's wonderful site. Incredible! Well, dear readers, you can also be the next lucky one! Just leave a comment under this post, make a wish and cross your fingers. Who knows what will happen? In any case, I am pretty sure the Fairy is listening and is eager to fulfill your dream. Good Luck and many thanks to my kind Fairy Hobmother David! Adapted from "Tagines & Couscous" by Ghillie Basan. Serves 2 (as a side dish). 1. Heat the oil in a tagine or heavy bottomed pan (cast iron), add the onion and garlic. Saute until soft and slightly browned. 2. Add the turmeric, cumin, cinnamon, cayenne, black pepper, honey and carrots. 3. 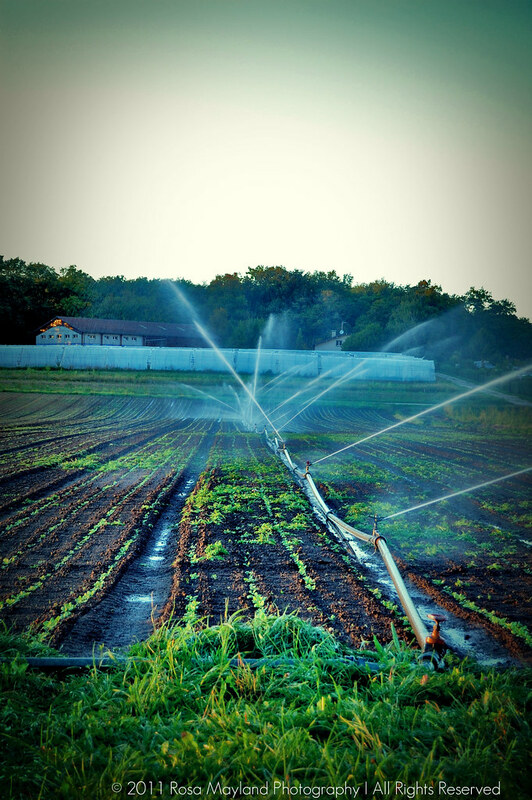 Pour in enough water to cover the carrots and cover with a lid. Cook gently for 10-15 minutes. 4. Toss in the chickpeas and check to make sure there's still enough water in the bottom of the tagine/pan, cover, and cook for another 5-10 minutes. 5. Add the rosewater and season with salt. 6. Remove from the heat and sprinkle the cilantro over the top. The rosewater is optional, but highly recommended as it adds a very interesting flavor to the tagine. Serve with a dollop of thick yogurt and some flatbread ("Batbout M'Khamer"). You can also scoop some of that tagine over some rice, couscous or bulgur. Recette adaptée du livre "Tagine Et Couscous" par Ghillie Basan, Editions Larousse. Pour 2 personnes (comme accompagnement). 1. Faire chauffer l'huile dans un plat à tajine ou une cocotte à fond épais (émail), puis ajouter l'oignon et l'ail et faire revenir jusqu'à tendreté (ils doivent être légèrement dorés). 2. Ajouter le curcuma, le cumin, la cannelle, le poivre de cayenne, le poivre noir, le miel et les carottes. 3. Verser suffisamment d'eau afin de couvrir les carottes et refermer avec le couvercle. Cuire doucement pendant 10-15 minutes. 4. Ajouter les pois chiches et assurez-vous qu'il y ait encore assez d'eau dans le fond du tagine/de la cocotte. Refermer avec le couvercle et laisser cuire encore 5-10 minutes. 5. Ajouter l'eau de rose et assaisonner avec le sel. 6. Retirer le tajine du feu/la cocotte et saupoudrer avec la coriandre. 7. Servir avec les quartiers de citron. L'ajout d'eau de rose n'est pas obligatoire, mais fortement recommandé car la saveur du plat s'en voit réhaussée. Servir avec un peu de yaourt épais et du pain plat ("Batbout M'Khamer"). Vous pouvez aussi servir ce tagine sur du riz, du couscous ou du boulghour. J'adore cette recette bien épicée. Elle est parfaite pour la saison! Le tajine de pois chiches est fort populaire chez moi. Ces parfums et ces épices nous donnent bonne mine en hiver! Tes photos sont encore géniales! C'est toujours un plaisir de passer ici. Un délice ce tajine coloré et parfuumé!! Un favuloso tajine, j'aime beaucoup les pois chiches et d'épices: un agréable week-end! Les très belles photos! Un superbe tajine et de belles photos comme toujours. Bisous et bon WE. bises Rosa and as usual, your pictures are fantastic, YOU are very talented !! 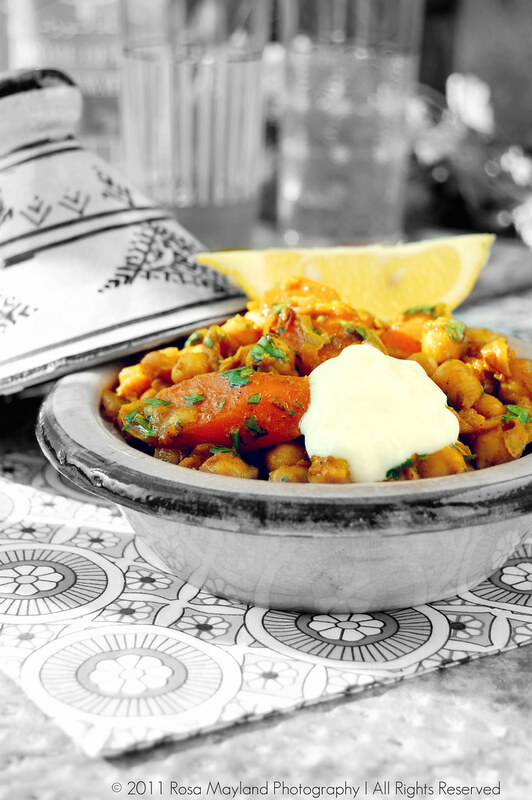 Beautiful styling with the tagine and chickpeas are very healthy, very much in style and very tasty! The recope sounds amazing Rosa. Comfort foods like this are on my mind these days. Congratulations also for being visisted by the Fairy Hobmother!!!! Oh, tu t'es surpassee pour les photos cette fois-ci Rosa. Que j'aime ces couleurs chaudes! 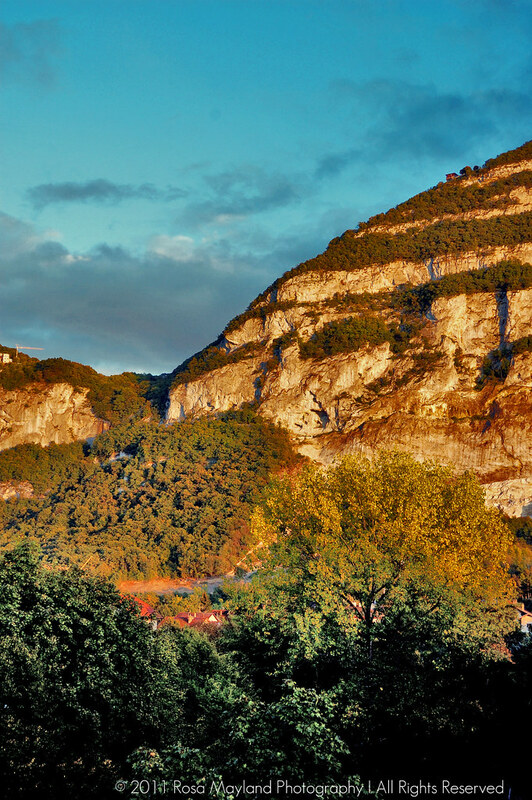 Celle su saleve est formidable aussi. This book sounds lovely and interesting - the tagine looks delicious and couscous is one of my favourite savoury dishes. Congratulations on your Fairy Hobmother visit! Rosa, I have the same problem with perfectionism, sometimes I wait and wait to do something because I want it to be perfect, I totally understand you. I am in the process of writing a book review too and I have one more recipe to try and then I am done, but it took me more than a month! This dish looks so tasty, thanks for posting it, and the pictures are awesome! I think this is a perfect dish for this time of year! Hearty, comforting and delicious. Congrats on your voucher, and I love the procrastinaton quote! I love tagine! This looks lovely and great for the chilly weather that we are having now. this looks delicious. I love the tagine its very beautiful! The black and white with color image is truly captivating. Gorgeous photos...an incredible appetizing looking meal and wishes granted...what more can a gal ask for? Rosa...Congrats on your good fortune! I love the (Salève?) photo! I love chickpeas... this dish looks super! I can't take my eyes off the plate! It so beautifully presented and looks so tempting! les photos sont ultra appétissantes ! j'aime ces saveurs ! What a terrific burst of flavors from spices and my fav chickpeas.I m going to try this soon..Love all the dishes you used..this book sounds great..Congrats &have a lovely weekend! I'm curious - why is there a hole in the lid? I love this cute pot! I'm not familiar with Tagine, but I enjoyed reading about this new food! It's wonderful that fairy paid you a visit! It (he) comes to someone who believes in it. :-) Have a great weekend! the procrastination quote is hilarious :) i can smell the spices Rosa.. nothing like a good tagine. I love the tagine pot and the wonderful colors and the flavors inside it. I should cook this. I'm kinda missing carrots and chickpeas! I need to make this this weekend! It has all my favorite flavors!! I have been dying to get a tagine...this recipe is makes me want to get one even more! It looks delicious and your pictures really took my breath away...stunning, Rosa! I am a dedicated procrastinator and will always wait until it's almost too late. That's terrible, but that's the way I do things. I can't help myself :) The tagine looks fantastic, I love the combination os spices. Your tagine looks beautiful, Rosa. Perfectly flavored and rich and comforting. 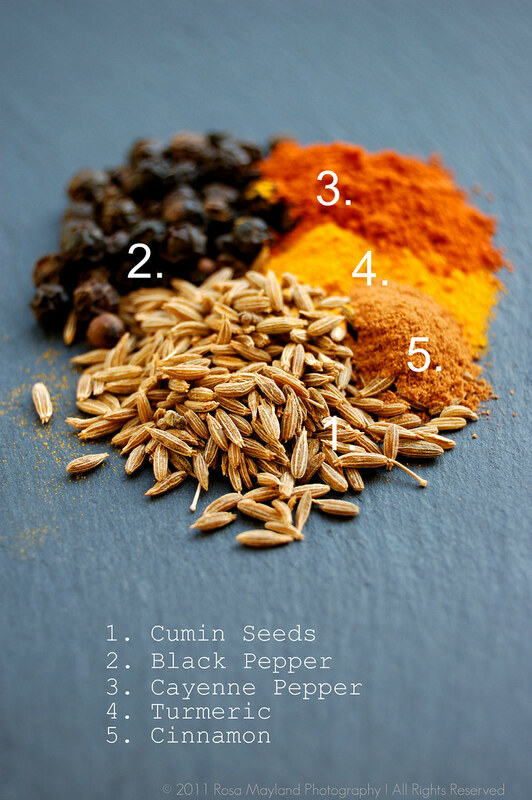 Love the photo of spices! Aren't you lucky to have had a visit from the Fairy Hobmother!! Rosa, congrats on your lucky pick by the Fairy Hobmother! And your bowl of healthy looking meal sounds incredible enough for me. Thanks & hope you're having a fabulous weekend, dear. This looks sooo good! And I love the way you photographed it! The photos perfectly compliment the recipe. 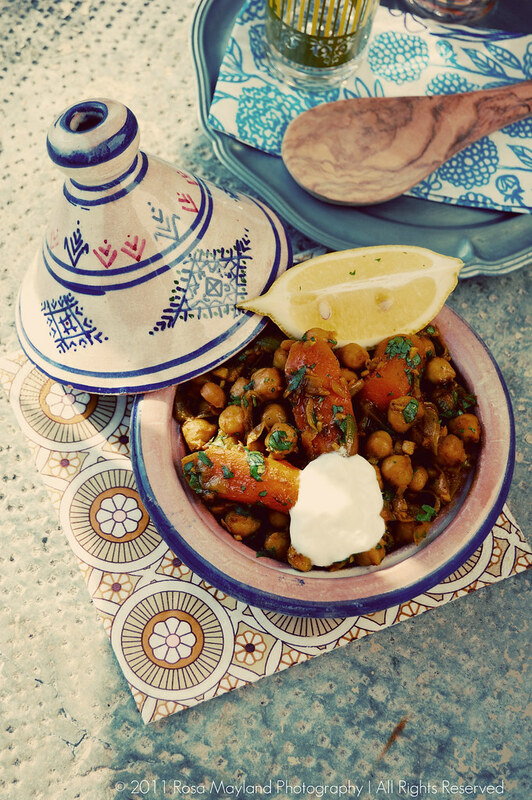 I'm a big fan of tagine and this looks scrumptious! Love, absoluteld LOVED all your shots. Especially the b&w one highlighting just the food in color--brilliant! Beautiful photos and a luscious recipe - as usual! J'ADORE TES FOTOS!!! interessante anche la riceta! compliments! Every picture is spectacular, as flavorful as the food. I too was visited by the fairy hobmother. Nice. Delicious-looking food. I love your photo presentation. What a gorgeous entree, Rosa. Certainly another one of your Yummy Yums! I would be so flattered if the Fairy Hobmother visited my blog; congratulations! Beautiful, Rosa! I love this hearty vegetarian dish for chilly weeknights. Especially love the addition of rosewater - surprising and yet such a great fit. Crazy about tagines. This recipe and these photos are gorgeous. I have never cooked tagine. Yours is such a gorgeous color. It looks like the perfect comfort food. Love the spices pic. I have a gorgeous tagine that I bought in Libya and carried back in my hand-luggage (my husband thought I was mad). This recipe is exactly the kind of thing I like to cook in it - spicy, wholesome, comforting. Do you think the fairy hobmother would deliver to Dubai?!! Rosa, there is a moroccan restaurant a few blocks away from my apartment that makes a dish just like this, and we love it. I can't wait to try this out! Thanks, dearest! i wish i may, i wish i might, i wish upon a star tonight to win a set of mixing bowls as most of my have broken and mixing cups as the 1/2 is missing. Love the spices and beautiful photographs. the list of ingredients might as well be titled 'things grace loves to smell and taste.' great dish, rosa! Exquisito plato Rosa es contundente y hermoso,quiero ser invitada a tu mesa muy bien servido,abrazos grandes hugs,hugs. Love the spicy treat Rosa! It 's great to know that Ghillie Basan's recipes can be cooked in a cast iron pan that is good for us who don't have the traditional one! Excellent pics I am spellbound as always! I have never hear of the fairy hobmother, we do seem to miss out on all these exciting blog rewards over here in NZ! Love the Tagine, I use mine often and have just posted a Moroccan treat that would follow your dish nicely. Que de couleurs et de parfums dans ce tagine. I so love tagine and yours, with all this amazing flavours must be a delight!! LOL I love the quote about procrastination. I need to stop doing that (procrastinating) hehe. I love the picture of the spices, amazing! This book sounds fantastic! I can commiserate about procrastinating even with great books. The vegetables and chickpeas look delicious with the spices here! 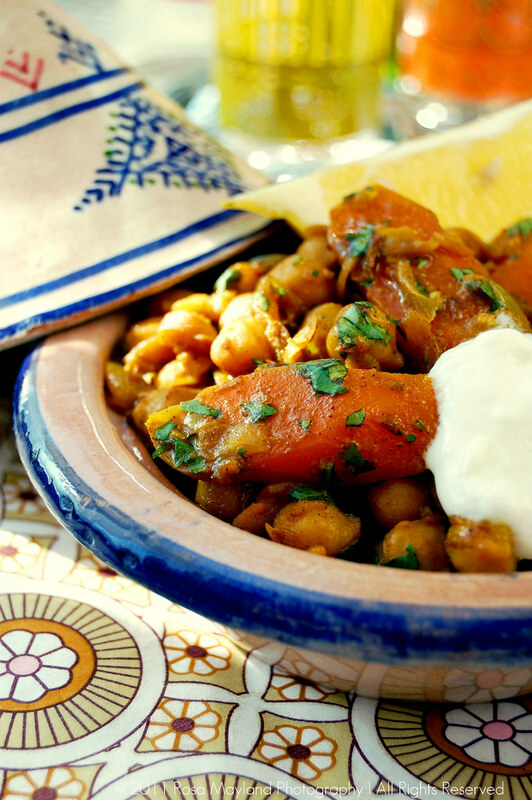 this recipe is perfect , i love carrots and tajine :) Your photos are beautiful as usual ! Rosa, Congratulations! I am so happy for you!!! I am speechless at your tagine..which looks absolutely stunning..so professionally prepared and presented. Your tagine is beautiful! I make so many things in mine, beyond tagine's themselves! It is my favorite cooking vessel, especially this time of year! I haven't had anything Morroccan in so long! I have to fix that and your tagine would most cerainly be a great place to start again! How exciting to get a visit from the airy Hobmother, so fun!! This is comfort food at it's best, lovely pictures rosa..perfection!! Your photos are amazing. The food is amazing. It looks absolutely great! What a scrumptious-looking dish! I'm so tempted to cook up something spicy now. I have all the spices here but would like to now about the rosewater...can I omit that? Or is there a replacement Rosa? I just want to dig a spoon into that. I love tagines with their warming spices. That picture of the spices looks wonderful Rosa! Hi Rosa, The chickpeas are looking so delightful and appetizing. A very well made post with beautiful pictures. Have a wonderful week ahead. Thanks & Regards, Sonia !!! That tagine is looking really good and I am liking the spice mixture in it. De bien belles couleurs automnales et des saveurs tout à fait délicieuses! J'adore l'eau de rose dans les plats salés! ooh, what an adorable tajine! I have a hard time believing that you are a procrastinator, your blog is always so dynamic with activity! That book may be "smallish" but it sure sounds like it's packed with a wallop of flavors! The photos are breathtaking. Beautiful dish! parfumé et coloré j'adore le tajine et a la maison il a toujours beaucoup de succès !! Thanks you for introducing me to Ghillie Basan, I wasn't familiar with her work before. Her recipes are exactly the type I would love to try in my kitchen. Wonderful, vivid photographs, stunning! Have a great vacation. 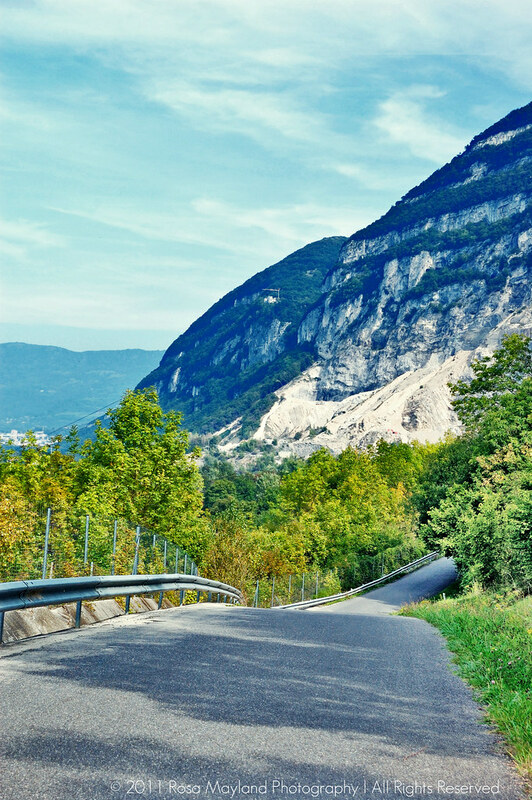 Hi, thanks for sharing the beautiful picture. The carrot with chickpea looks delicious. What a delicious looking dish. One of my favourite cuisines to eat. Gosh what a delicious dish. Love the colors, spices and everything else!! What an amazing post Rosa. Delcious tangine, fabulous review and pictures that make me want to be here forever! stunning work, rosa--the blend of flavors and colors is pretty close to unbeatable! girl, this looks like such a wonderful fall dish. i love chickpeas in anything! and a tagine dish so hearty. and i'm with you on procrastinating... i have over 10 books to review and i'm so overwhelmed... not to mention recaps of press trips i'v been to. i know exactly what it is though--- the picture editing! that stumps me every time! C'est vraiment magnifique, ce doit être divin !!! I'm laughing at the quote about perfectionism, sadly I fall victim to that tendency along with procrastination and it's infuriating since I know better but yet can't seem to prevent myself from repeating the cycle. Mmm à essayer au plus vite!! En version cocotte pour moi car pas de tajine encore à l'appartement! Très jolies photos et recette! Thank you for sharing this. I have included this the Kosher Cooking Carnival I hosted this month. Thanks so much for posting this. I'm always looking for a vegetarian tagine dish. And i love chickpeas. I have trouble cooking in a tagine sometimes though...Did you cook in a tagine? any tips? love love the photograph of the spices! the gorgeous colours literally jump off the page. 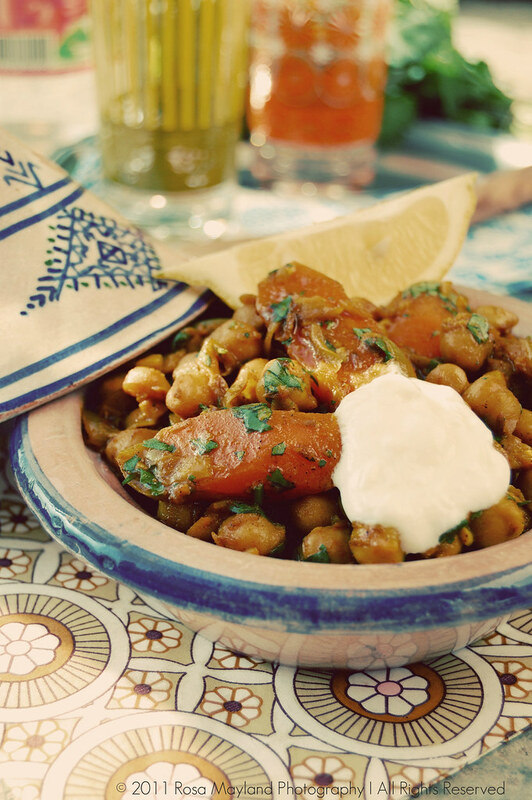 I could go for that lovely chickpea tagine now! And Rosa, you don't have a procrastinating bone in your body (Thank goodness for that). Always wanted to make one, but I have to buy the Tagine pot or else its not the same for me. How I wish you were my neighbor.